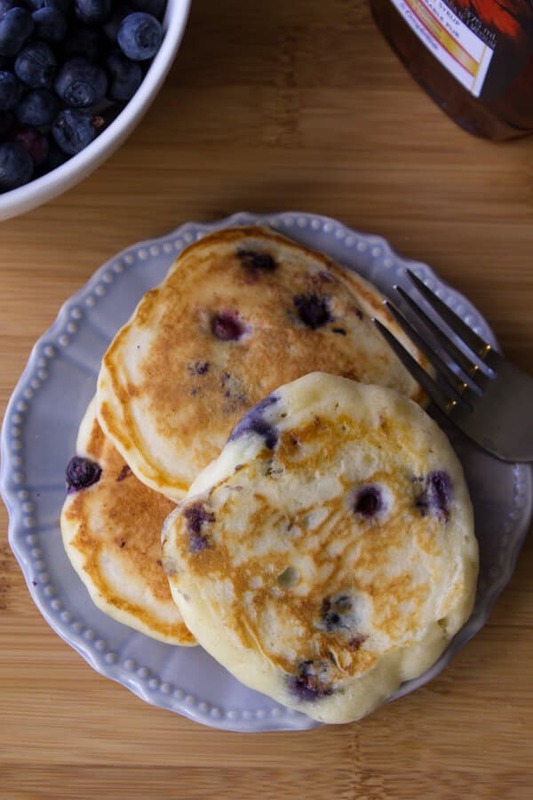 Light & fluffy Blueberry Buttermilk Pancakes. Super easy and quick to make – you’ll never need another recipe after eating these delicious pancakes! How was your weekend? Did you do anything fun? Eat something delicious? Relax with some wine? I did all three! Ok. But let’s focus on the eating part. I’ve been out of town the past few weekends – so I decided to make something special for breakfast on Sunday since I haven’t in awhile. I made Blueberry Buttermilk Pancakes. 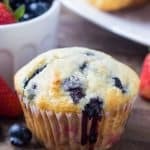 Fluffy & buttery, golden brown on the edges and filled with fresh blueberries – pretty much the perfect breakfast. But these pancakes will satisfy even the pickiest pancake connoisseur. Delicious. Super easy to make. And no fancy ingredients. Perfection. First, the flour gives your pancakes texture & structure. Then the baking powder & baking soda makes them rise so they’re light & fluffy. Salt brings out all the other flavors, and the sugar adds sweetness while also giving the pancakes their nice golden edges. 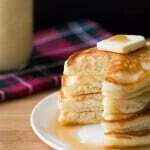 Then the butter and eggs add richness to the flavor, and make your pancakes soft & tender. And finally – the buttermilk. Buttermilk creates a soft crumb, makes your pancakes moist and helps them be light & fluffy. Talk about jack of all trades! If you don’t have buttermilk on hand – you can create your own by adding 1 tablespoon of distilled vinegar to a liquid measuring cup and filling with milk to the 1 cup line. Then leave it to sour for about 5 minutes – and you have one cup of buttermilk. Problem solved. 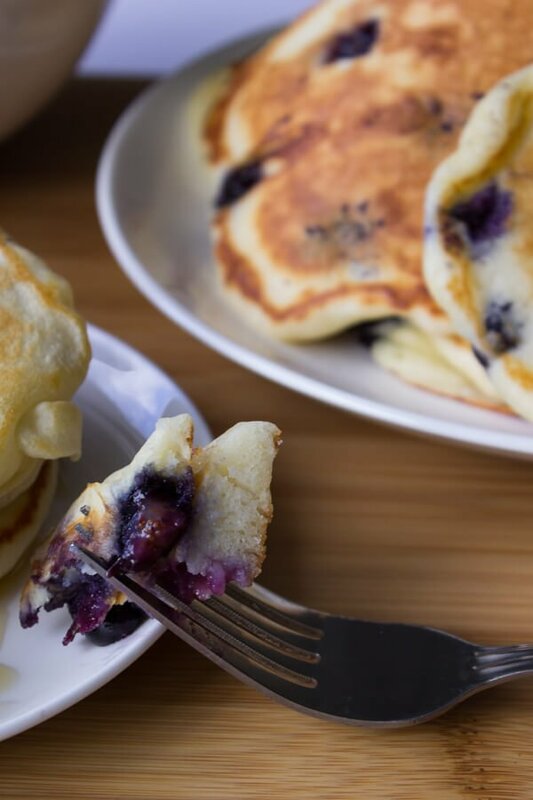 I made my pancakes with blueberries, but these would also be delicious with strawberries or chocolate chips or plain. Serve them with maple syrup, maybe some whipped cream – and of course a big coffee – now that’s worth waking up for! 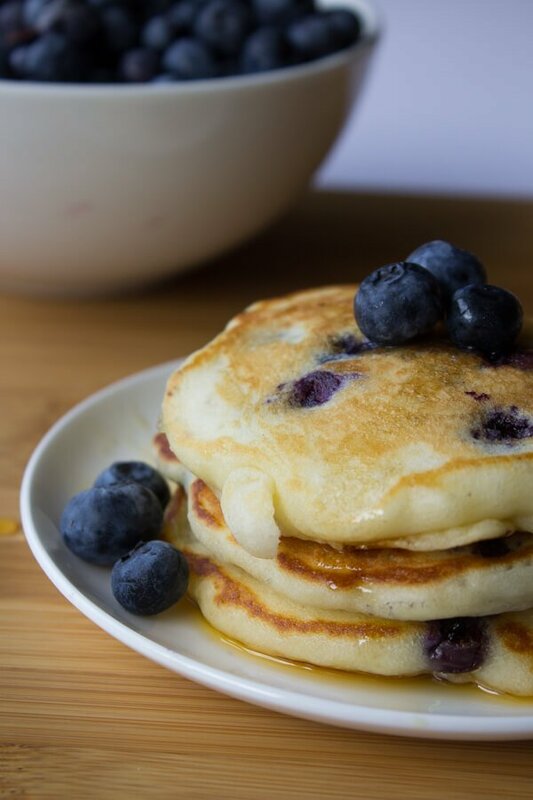 Light & fluffy Blueberry Buttermilk Pancakes. 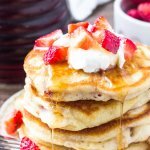 Super easy and quick to make - you'll never need another recipe after eating these delicious pancakes! In a large bowl whisk together the flour, baking powder, baking soda, salt and sugar. 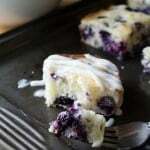 Carefully fold the wet ingredients into the dry until almost combined - then fold in the blueberries. Having a few lumps in the batter is ok. Turn on an electric griddle to 350F degrees or heat a frying pan on the stove burner to medium heat. Grease the pan or griddle with non-stick cooking spray or butter. Then pour about 1/4 cup batter onto the pan or griddle, spacing the pancakes a few inches apart. Once you start to see bubbles forming on the uncooked top (about 2-4 minutes), flip the pancakes over and continue cooking for another 2-4 minutes until both sides are golden brown. *You can make your own buttermilk by adding 1 tablespoon distilled vinegar to a liquid measuring cup. Then fill to the 1 cup line with milk and let stand for 5-10 minutes to sour. **If using frozen blueberries, don't de-thaw the blueberries first. I’m so glad you liked them – I’m sure they were delicious with Saskatoons!